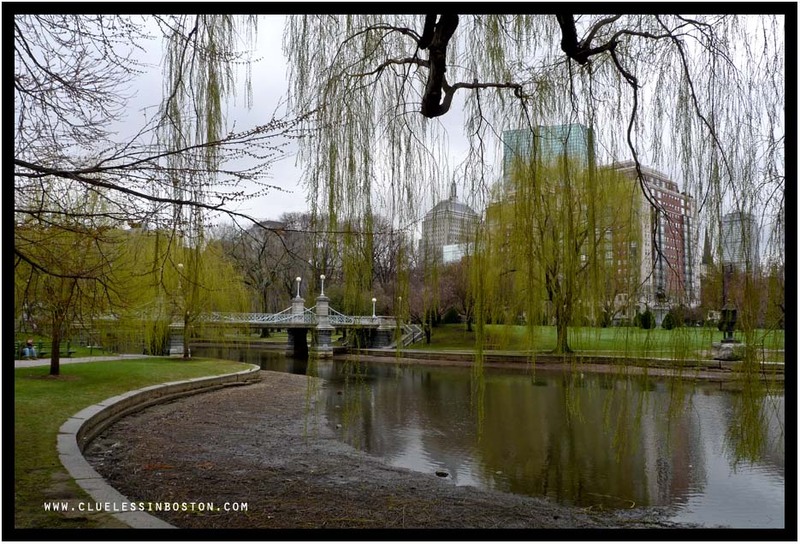 The pond in the Public Garden had been drained. The water you see here is from all the rain we've gotten recently. The grass and the ground have a special perfume after the rain, that I like very much. I can feel it from your picture! Beautiful photo but why do they drain it? Are there no fish living in it? I agree with Malyss. This image is redolent with spring. I think everyone seems to be getting rain at the moment, it's coming down here right now. Stay dry and enjoy the holiday. Though Malyss is very poetic about it, I'm merely impressed by the torrential rain you must have had. The rain is coming down steadily in Tulsa this morning. Should we build an ark? I'm distracted by the weeping willows. I love them but we don't have any in Manila. I hope you can take more photos of them when they're lush again. I love so much this sweet light green color of the early spring. Beautiful. Beautifully composed shot! Love those trees in the foreground. Looks like the drainers will have to start again! Yes, why do they drain it?